By car: Turn right at the first set of traffic lights into Saatwinkler Damm. Turn left into Seestrasse, which will run into Osloer Strasse, Bornholmer Strasse, Wisbyr Strasse, Ostssee Strasse, Michel Angelo Strasse, Kniprode Strasse. At the 3rd side street turn right into Storkower Strasse. 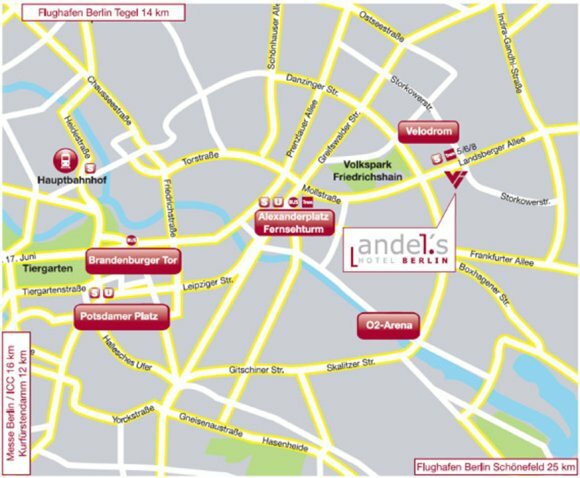 After about 2 km you will reach the andel’s Hotel Berlin. Public transport: Take the bus “TXL” to busstop “Beusselstrasse”.Transfer into the S-Bahn S41 (Ringbahn) to stop “Landsberger Allee”. By car: Drive in direction North to reach Walthersdorfer Chaussee, which will run into Neuköllner Strasse, Rudower Straße, Buschkrug Allee, Karl Marx Strasse, turn right at Herrmann Platz and straight on into Kottbusser Damm, please turn right into Skalitzer Strasse, straight on into Warschauer Strasse, which runs into Petersburger Strasse, after 2 km turn right into Landsberger Allee. After 1 km you will reach the andel’s Hotel Berlin. Public transport: Take the S-Bahn S9 (Direction: Spandau) to stop “Adlershof”. Transfer into the S-Bahn S8 (Direction: Blankenburg) to stop “Landsberger Allee”. Public transport: With S-Bahn S7 (Direction: Ahrensfelde) to stop „Alexanderplatz“. Transfer into the Metrotram Line 5 (M5 – Direction: Hohenschönhausen / Zingster Straße) to stop “Landsberger Allee”. Copyright © 2019 Berlin Security Conference. Alle Rechte vorbehalten. Sie können Ihre Cookie-Einstellung jederzeit hier ändern: Imprint & Conditions.